Make communication easy with Travis! With Google Pixel Buds last year, the major point of attraction was its ability to translate 40 languages in real time. With the fast-developing technology, this seems to be an old news now. Consumer Electronic Show 2018 in Las Vegas witnessed an innovative gadget way ahead of Pixel Buds. Travis, a small startup company from Netherlands unveiled its new gadget. The small looking nifty gadget easily translates conversations in real time. With Travis, you can now eliminate any and every language barriers and converse freely across the globe. What is more astonishing is that it can translate 80 different languages in real time. Isn’t that great! 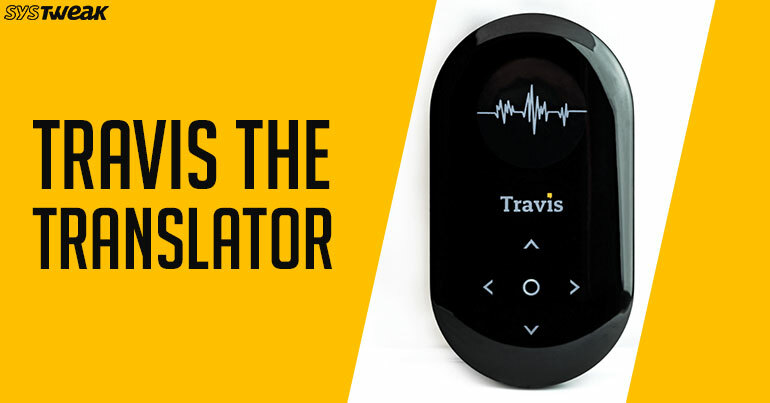 Travis is a small portable device that lets you connect with people easily. It effectively joins software and the special hardware that results in real-time language translation. Travis translates every possible combination of 80 languages and syncs them by performing all the computations in the cloud. Travis is now emphasizing on digitizing the not so popular languages. As per Elissa Glorie, the international affairs manager, “Once a language is digitized it can not only be used in translation technology like Travis but for education and preservation”. Real-time translation in 80 different languages. It makes use of Artificial Intelligence. The more you speak, the more AI learns from it and translates better. Quad Core processor makes computation easy and fast. Can be used both while online and offline. Has a 12 hours battery backup on a single charge. Earphone compatibility. Easily works with Bluetooth and audio jack thereby provides extra security. Having said that, we think Travis is an ultimate solution to overcome language barriers and communicate with people from every corner of the world.